On Daemen Day of Giving, alumni, faculty, staff, trustees, and friends of the college will have the opportunity to make a gift online for the one-day special fundraising effort. Gifts will go toward student scholarships, academic and co-curricular programs, and facility enhancements at the college. The 2019 Daemen Day of Giving will officially start at 12 a.m. on Wednesday, April 10. Real time updates on the number of gifts received will be posted online throughout the day. Every gift will count toward the overall goal of 175 gifts for the one-day campaign, which will include challenge gifts to help boost participation. 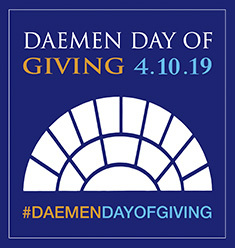 Members of the college community will be encouraged to use the official hashtag #daemendayofgiving to raise awareness about this special initiative. Additional information is available on the Daemen Day of Giving website. To learn more about Daemen’s recent successes and growing momentum, please view this college video.